Zibalian transport and merchant vessel commanded by Kivas Fajo. Houses his collection of rare and one-of-a-kind objects. Used to imprison Data in 2366. Special skill(s): Once per game, may capture an android on an undocked ship here. Kivas Fajo. 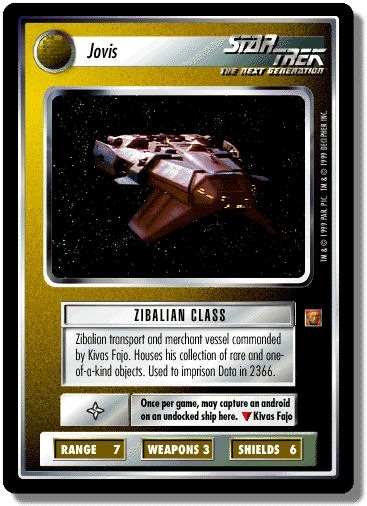 Characteristics: "Continuing Mission"-related cards, Capture, "affiliation", Merchant vessel, Transport. There are 39 entries for Jovis (ST1E 8 R 125) at the Tradeplace (52 haves and 10 wants). Click here to see all trade list entries for this Rare card!